I had the pleasure of test driving some of the most amazing products found in top salons across America. Cezanne offers a complete range of products that are 100% formaldehyde free which creates smoother, straighter and frizz-free hair while maintaining the hair's natural shine. Cezanne products are favorites of many celebrity stylist an are often requested among many of their celebrity clients as well. 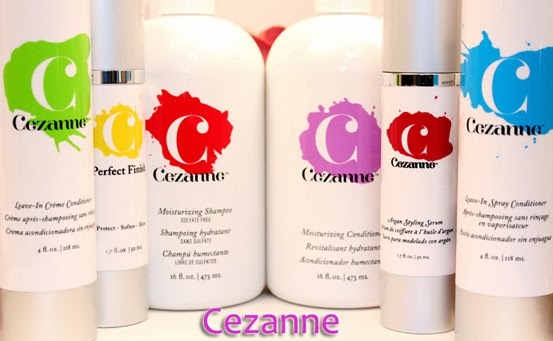 Cezanne is also the mastermind behind the "Perfect Finish Keratin Smoothing Treatment" (CPF). This patented formula is designed to smooth and straighten the hair delivering a powerful effect with results similar to that of the Keratin or Brazilian straightening treatments. What are the Benefits of Cezanne? It is a 100% formaldehyde free, next generation smoothing system that uses the latest advances in science, along with only the finest ingredients, to create a product that delivers the results of a traditional keratin smoothing treatment without the harmful chemicals. Using the best quality ingredients and without unpleasant odor, CPF outperforms and outlasts carbocisteine and amino acid products, and CPF doesn’t break the disulfide bonds, which can be damaging to the hair. Cezanne Moisturizing Shampoo Sulfate Free - This shampoo smells so incredible fresh! I had never used a sulfate free shampoo before so I didn't know what to expect. Normally I judge my wash by the amount of lather that I see fall in the sink but with the sulfate free shampoo, there's not much lather. I knew my hair was very clean after two washes so I proceeded to the next step... conditioner. Cezanne Moisturizing Conditioner - This conditioner has an amazing smell as well. As I sectioned my hair apart and applied this conditioner, I noticed how my coils were combing apart and how incredibly soft my hair was feeling. I hardly had to use a large amount, very little was needed. I completely covered my hair with conditioner and finger combed it through. Since I only wash my natural hair every 8 to 10 days at most, I deep conditioned it under a heating cap about 15 mins, this step is neccessary to penetrate the conditioner even more. Once finished, I rinsed thoroughly and proceeded to the next step. Cezanne Leave-In Cream Conditioner - revitalizes the hair from roots to ends with a proprietary blend of keratin's, premium oils and proteins designed to smooth ends while adding incredible shine. Cezanne Leave-In Spray Conditioner - is an instant detangler that fortified and nourishes the hair with a subtle blend of keratin protein designed to add extra shine and body while adding increased manageability. Argan Styling Serum - This unique blend of Argan Oil is formulated to allow instant absorption into the hair, delivering luminous shine and long-lasting conditioning results. Cezanne Perfect Finish - Is an exclusive product for Cezanne that allows you to get a gorgeous salon-ready look at home every time you blow-dry or flat-iron your hair. Perfect Finish protects your hair from the harmful effects of heat, while also providing additional fritz control and shine. Ways to Explore Cezanne! Website, Facebook and Twitter! 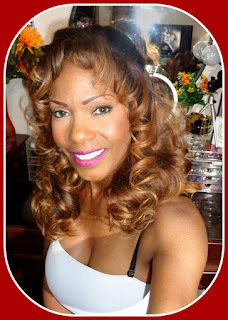 My natural hair texture is very curly which causes my ends to become frizzy and tangle quite often. Normally to combat this problem, I use a lot of natural oils such as olive, coconut, macadamia and even Shea butter to smooth out my hair. 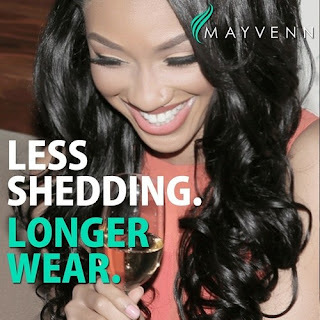 Sometimes too much oils can have a reverse effect by clogging the hair follicles and irritating the scalp. So for this reason, I'm always searching for the next best thing to manage my very curly natural hair. After I wash and condition my natural hair, I proceed to braid it and let it dry overnight avoiding any heating or drying elements. What I decided to do was use a little bit of both leave-in conditioners, applying thoroughly while braiding. My hair felt so incredibly soft as if it was melting in my hands. Normally at this point i'm using a mixture of oils to keep it soft and manageable as i'm braiding, but this was all about Cezanne so I only used their products and no oils. My hair stayed tangle free and soft throughout the entire braiding process. The next morning when my hair was completely dry, I dabbed on a little of both styling products, the Serum and the Perfect Finish, then I proceeded with the final steps of fluffing and styling. I have a severe form of alopecia around my hairline as you can see in the third pic, but I loved how soft my natural hair felt as I was combing it through. Throughout this entire process, I did not use any heating or straightening elements and I am 100% all natural! ... but I still love wearing my Wigs!